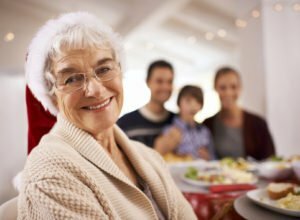 While the holiday season is usually thought of as a joyous time, full of visiting loved ones and buying gifts, it’s important to remember that holidays for seniors can be anything but merry and bright. A combination of lost loved ones, memories of holidays past, health problems and more can impact seniors with feelings of loneliness and sadness. Take a drive to look at holiday lights. Perhaps you can visit an old neighborhood that your senior family member has memories of. If your elderly family member has difficulty moving around to set up holiday decorations, then offer your assistance! This can be a great opportunity to share memories of past holidays and what different decorations may mean. Hired Hands Homecare can also offer help with holiday decorating. For a really relaxing holiday experience, plan an afternoon together at a local beauty shop or spa. If it’s possible, you could even arrange for a local beautician or masseuse to visit the home. Safety concerns may also come into play for your senior loved one, for a variety of reasons: increased fall risks with all of the extra holiday décor, difficulty sticking to a prescribed dietary plan, and for those with Alzheimer’s disease or other forms of dementia, disruption to routine, additional visitors, and heightened noise levels can all wreak havoc. Keep decoration safety in mind. Make sure there is plenty of room to walk, and try to use simple, non-cluttered decorations. Dim lighting can hide things that seniors could trip over, such as extension cords. Consider setting aside a “quiet room” for the senior if the excitement of children, holiday music and activities become overwhelming. Assign someone to be the senior’s “buddy” for the day, ensuring his or her needs are fully met and providing a wonderful bonding opportunity for both. The holidays should be fun and relaxing for everyone. With a little pre-planning and extra thought, holidays for seniors can be enjoyed as much as they are by everyone else, creating new memories that the whole family will treasure for a lifetime. And, if in the midst of the holiday hustle and bustle you could use the assistance of a trained senior caregiver, Hired Hands Homecare is here to help! Give us a call at 866-940-4343 to learn more about how our California senior care services can enhance the holidays for you and yours.